In the months since our last faculty book roundup, new and revised titles by Wellesley authors have hit the shelves. Impressive scholarship and creativity reveal themselves in faculty work ranging from original poetry to authoritative editions of classic texts. English, French, and Political Science are well represented in recent publications, as evidenced by the following nine thumbnail descriptions. Bicentennial: Poems. Associate Professor of English Dan Chiasson. Knopf, March 2014. In Bicentennial, Chiasson revisits the kind of autobiographical poems he wrote as a young man, but with a new existential awareness that individuals are always vanishing in time, and throughout the collection he ponders time's conundrums. "All of history, even the Romans, / they happen later, tonight sleep tight," he tells his sons at bedtime. "You'll learn this later. Tonight, goodnight." Politics in China: An Introduction. Second edition. Professor of Political Science William A. Joseph, ed. Oxford University Press, April 2014. Politics in China is an authoritative introduction to how the world's most populous nation and rapidly rising global power is governed today. 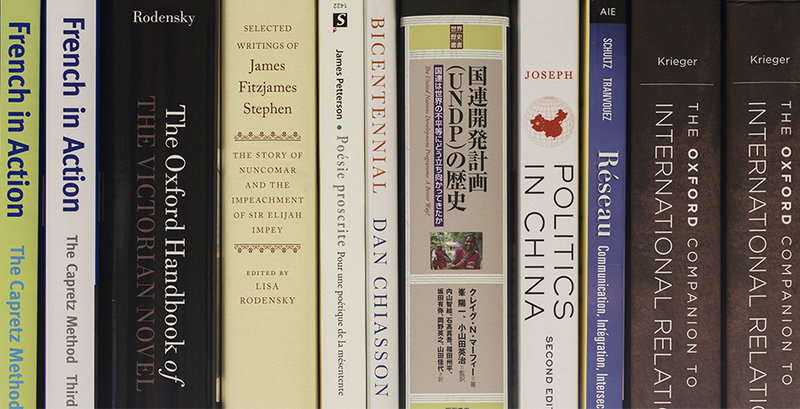 Written by leading China scholars, the book offers accessible overviews of major periods in China's modern political history from the mid-19th century to the present, key topics in contemporary Chinese politics, and developments in four important areas located on China's geographic periphery: Tibet, Xinjiang, Hong Kong, and Taiwan. The Oxford Companion to International Relations. ed., Norma Wilentz Hess Professor of Political Science Joel Krieger. Oxford University Press, April 2014.
International relations has long been a core discipline within political science, and of vast importance for understanding social, cultural, economic, and political exchanges across national boundaries. The two-volume Oxford Companion to International Relations may be one of the first reference works to make this field clear and comprehensible to both specialists and nonspecialists. French in Action: Third Edition, Part One. Pierre Cavetz and Professor of French Barry Lydgate with Béatrice Abetti and Marie-Odile Germain. Yale University Press, May 2013. Since it was first published, French in Action: A Beginning Course in Language and Culture—The Capretz Method has been widely recognized in the field as a model for video-based foreign-language instructional materials. The third edition has been revised by Pierre Capretz and Barry Lydgate and includes new, contemporary illustrations throughout and more-relevant information for today's students in the Documents sections of each lesson. The United Nations Development Program: A Better Way? (New Japanese Translation). M. Margaret Ball Professor of International Relations and Professor of Political Science Craig N. Murphy. Akashi Shoten, March 2014. The United Nations Development Programme is the central network co-ordinating the work of the United Nations in more than 160 developing countries. This new Japanese translation of Craig Murphy's 2006 book provides an authoritative and accessible history of the Programme and its predecessors. Based on the findings of hundreds of interviews and archives in more than two dozen countries, Murphy traces the history of the UNDP, arguing that the principles on which the UNDP was founded remain as relevant in a world divided by terrorism as they were in the immediate aftermath of the Second World War—as are its fundamental problems. Poésie proscrite: Pour une poétique de la mésentente. Professor of French Jim Petterson. Septentrion, July 2013. Poésie Proscrite: Pour une Mésentente de la Poésie opens a new line of inquiry into the present-day stakes of poetry through in-depth investigations of the mishearing of French poetry by philosophy, history, politics and the law. Since the 17th century, at the heart of French poetry's literal and metaphorical trials and proscriptions has resided a fundamental mésentente of the very nature of language, one that crisscrosses and informs the literary politics of French national identity. The Oxford Handbook of the Victorian Novel. ed., Barbara Morris Caspersen Associate Professor in the Humanities and Associate Professor of English Lisa Rodensky. Oxford University Press, July 2013. Much has been written about the Victorian novel, and for good reason. The cultural power it exerted (and, to some extent, still exerts) is beyond question. The Oxford Handbook of the Victorian Novel contributes substantially to this thriving scholarly field by offering new approaches to familiar topics (the novel and science, the Victorian Bildungsroman) as well as essays on topics often overlooked (the novel and classics, the novel and the OED, the novel and allusion). As the Victorians get further away from us, our versions of their culture and its novel inevitably change; this Handbook offers fresh explorations of the novel that teach us about this genre, its culture, and, by extension, our own. Selected Writings of James Fitzjames Stephen: The Story of Nuncomar and the Impeachment of Sir Elijah Impey. ed., Lisa Rodensky. Oxford University Press, October 2013. The Story of Nuncomar and the Impeachment of Sir Elijah Impey (1885) examines some of the most controversial events of 18th-century English colonial legal history from the point of view of Victorian England's most important legal authority. This book offers important contextual information that not only supports scholars who undertake work on this historical period but also allows a wider readership to understand more fully Stephen's complex and provocative text. Réseau: Communication, Intégration, Intersections. Second edition. Senior Lecturer in French Marie-Paule Tranvouez and Jean Marie Schultz. Pearson, January 2014. Now in its second edition, Réseau conceives of the teaching of French as a holistic endeavor, one comprising language skills—speaking, listening, reading, and writing—as well as cultural knowledge in the broadest sense. The textbook is based on the belief that knowledge of a second language and culture necessarily brings about a greater understanding not only of the world in an increasingly global context, but also of the individual self. Upcoming books not yet in print will be featured at the end of next semester.